El Meco is the second closest archaeological site to Cancun and is perfect for families exploring the history and culture of this tropical paradise. Located on the north exit of Cancun along the shoreline with the Caribbean this archeological site is quite easily reached. It is believed that the ruins of El Meco originate somewhere between the 13th and 16th century AD and were an important trading spot for the Mayan people. 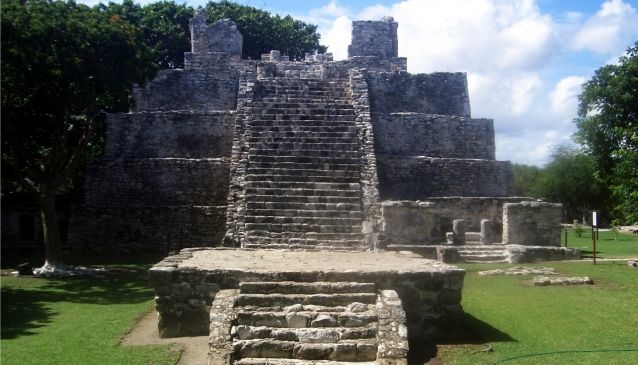 The central plaza which is dedicated to the rain god Chaac has a pyramid called El Castillo (the Castle). Climb El Castillo and witness breath taking views of the surroundings that include Chackmochuc Lagoon. You can reach El Meco on your own initiative as it's only 5 km from Cancun or you can enjoy it as part of the many tours provided by the local tour companies.